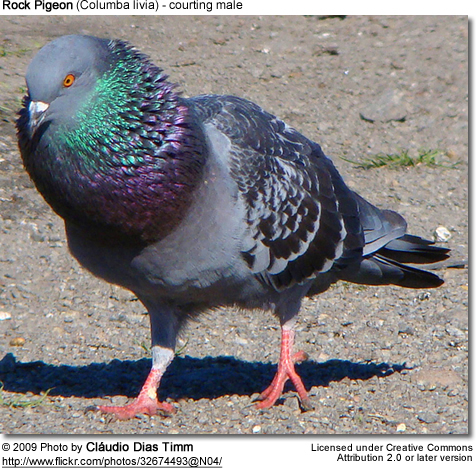 The Rock Pigeons (Columba livia) are also known as feral or domestic pigeon. 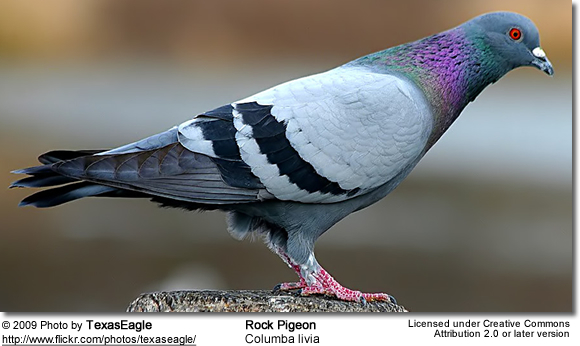 Previously they were called Rock Dove until the British Ornithologists' Union and the American Ornithologists' Union changed its current official English name. Feral birds are common in urban parks and neighborhoods, around farms, under highway or railroad bridges. They are often seen in larger flocks and crowd streets and public squares walking on the ground and pecking for food (usually discarded food items or birdseed offered by humans). They often gather in flocks. When spooked, the flock may suddenly fly into the air and circle several times before coming down again. Their life span is 3 – 5 years in the wild; and up to 15 years in captivity. Some longer-lived specimens have been reported. These intelligent birds have extraordinary navigation abilities and have served humans honorably throughout history. 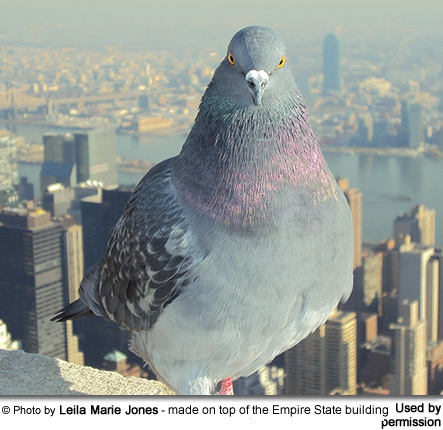 Trained birds are commonly used as homing or messenger pigeons. When released at a new location up to 1,000 km (over 600 miles) away -- they will still find their back home to their loft. 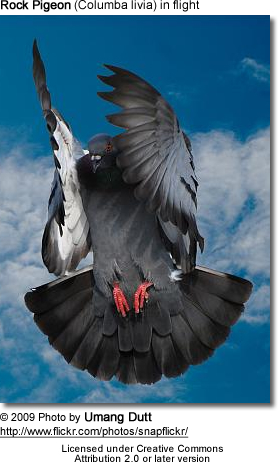 This impressive ability is the basis for them being used to carry messages or (in most recent history) for use in pigeon racing. Some of the so-called "war pigeons" have literally saved thousands of human lives and have been decorated for their service. Medals, such as the Croix de guerre, was awarded to Cher Ami, and the Dickin Medal awarded to the famous G.I. Joe. They were also commonly used in maritime rescue operations as they were more effective than humans in spotting shipwreck victims at sea. They have also shown importance during laboratory experiments in biology, medicine and cognitive science. For instance, these smart birds have been trained to distinguish between cubist and impressionist paintings. Scientists have also researched their shape and texture perception, exemplar and prototype memory, category-based and associative concepts. They have a wide range that includes western and southern Europe, North Africa, and southwest Asia. They were introduced to North America from Europe in 1606 at Port Royal, Acadia (now Nova Scotia). Its domesticated form (feral pigeon) has been introduced in other areas; and they are now very common over much of the world. They live in cities, breeding in any covered space within buildings or bridges. The original (pure) form inhabits natural rocky cliffs - usually on coasts; and is now mostly found in the remote areas of Britain, Ireland, and much of its former range. They average 30–35 cm in length and have a wingspan of 62–68 cm. 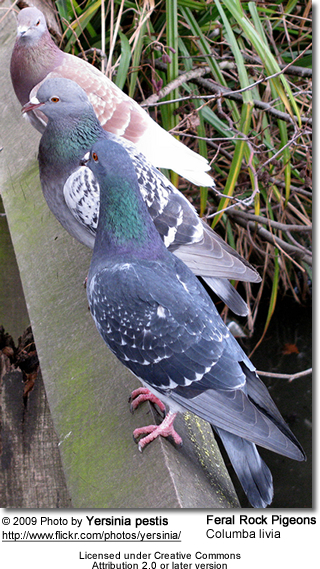 The pure Rock Pigeon can most easily be identified by its white lower back and the two black bars on its pale grey wings. The plumage is variable in color; but most of them are bluish grey with two black bands on the wings and a black tail tip. Most have flashy iridescent throat feathers. Other than the typical blue-grey plumaged birds, a reddish variety also exists, which is more common in the southwestern United States than in northern and eastern areas. Variable in color, but most birds are bluish grey with two black bands on the wing and a black tip to the tail. The wing patterns usually consist of two bars, sometimes with dark spots; but can also be plain. The tail is usually dark tipped with a white margin. The head and neck of the mature bird are a darker blue-grey than the back and wings. They mostly have orange-colored eyes - but some individuals have white-grey irises. The eyelids are orange and the eyes are encircled with grey-white eye ring. The immature plumage is overall duller. 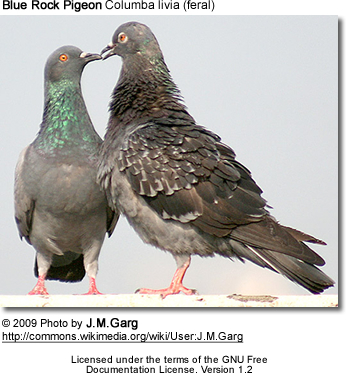 Stock Dove: The Rock Pigeon's green and purple patch on the side of the neck is larger than that of the Stock Dove and its tail is more distinctly banded. As part of their courtship ritual, the males puff up their nape (hind neck) feathers to make themselves appear bigger to impress and attract the attention of females. They will then pick a female and approach her at a rapid walk - often bowing as they get closer to her. Females usually walk away or fly short distances; at which point the males will follow them persistently. Eventually, the female will tolerate the male at which point he continues the bowing motion and makes full- or half-pirouettes in front of the female. The mating usually occurs shortly afterwards and only lasts for a few seconds, with the male mounting her and balancing on top of her back, flapping his wings to maintain balance on the female. Sometimes the pair's beaks are locked together. The male typically chooses the nest site, then coos to the female, to attract her to this site. Once the nest site has been accepted by the female, she prepares a flimsy platform nest with straws, grass, stems, sticks and/or even seaweed (depending on availability) brought to her by the male. The nest is usually located in a nook, cranny, or on the ledge on either cliffs or manmade structures, often beneath eaves or overhangs. 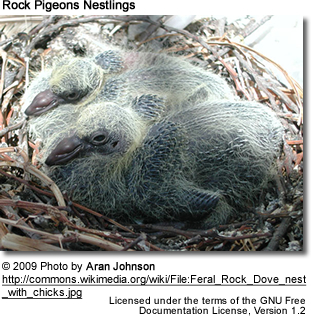 They may also nest on rain gutters, in stairwells or in rooms of abandoned buildings. They usually reuse their nests many times. As they don't carry away the feces of their nestlings away, the lightweight nest grows over time into a sturdy, potlike mound - usually incorporating unhatched eggs and mummies of dead hatchlings. Mass nesting is common with several couples nesting in or under the same structure. The female lays between 1 - 3 eggs (the average being two) , which are incubated by both parents for about 18 days. 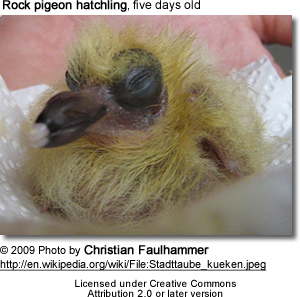 The hatchlings are helpless with sparse pale yellow or white down, and have flesh-colored beaks with a dark band. The parents feed them with regurgitated "crop milk". 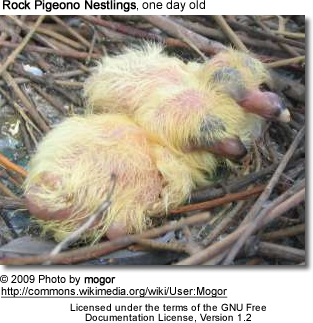 The young leave the nest when they are about 25 - 32 days old. During the courtship and nesting period, their well-known "coo-ing" calls can be heard almost on a continuous basis. Ferals are often considered pests or even vermin, as they are said to spread disease, damage property, cause pollution with their excrement, and harass and eventually drive out other bird species. Because of that, they are often referred to as sky rats, rats with wings, or gutter birds. In Montreal, Quebec, Canada, they are even called flying ashtrays. Efforts to reduce their numbers include poison, hawks or nets. However, all this with limited results. These birds will reproduce when food supplies are plenty and in urban areas they scavenge on discarded food items by individuals, restaurants and supermarkets. In optimal conditions, they may nest up to six times a year. The only long-term solution for reducing the population is to restricting their food supply, which is likely to involve legislation and litter (garbage) control. One effective control method was applied in Neunkirchen, Saarland in Germany. The town constructed an attractive "pigeon condo" in a park next to a river and also a platform for bird food. All this appears to be contrary to the goal of reducing their numbers. However, providing these birds a suitable habitat has decreased their numbers in the city streets and on buildings -- and unknown to the birds, the feed they are provided included a supplement which renders them infertile, which has effectively reduced their numbers over time.